Buying things when they are on sale and stocking up is one of the biggest ways I save money on groceries. With that, the deep freezer we bought a couple years ago has been great at storing the food we buy on sale. Things like bread, cheese and meat. The hardest part though is remembering what we have in the freezer and over buying on one thing and then not having enough room for something else that we need. So I decided to make a freezer inventory. This way I can easily see what we are low on and whether or not we need to stock up on a particular item or not. I made a simple inventory on a Word document. Feel free to download and edit the attached document. It takes a little bit of time in the beginning to log everything, but once it's done it saves so much time and money (i.e. not over buying). One word of advice, I waited until we emptied most of our freezer so I didn't have that much to sort through. I got a simple magnet holder and it holds my inventory list and a pencil right on the deep freezer. That way as I take something out, all I have to do is cross off what I took out. It works great! 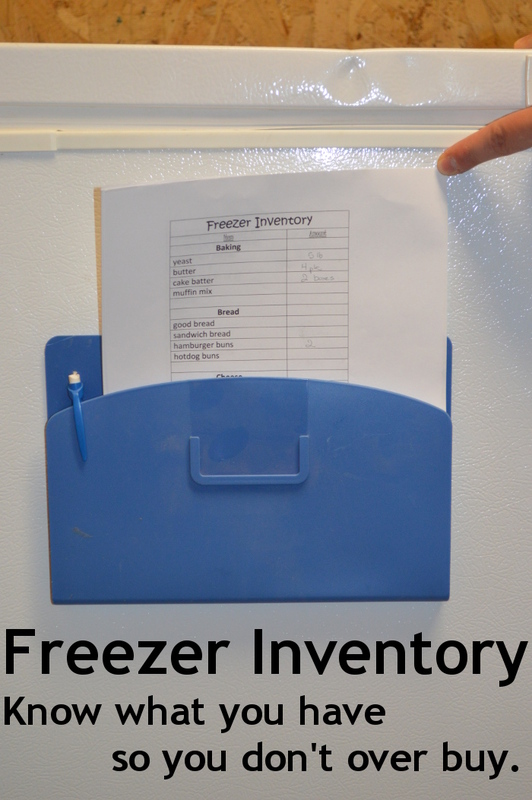 Another option would be to tape the inventory to the top of the freezer and add a pencil taped to string. No need to spend any money, and it makes it more hands free if you are balancing a little on your hip. Now, I just need to make one of these babies for my fridge freezer and pantry.